At the end of October, I attended the 2018 Yacht Racing Forum. Organised by Geneva-based MaxComm Communication, this year’s edition visited Lorient, in a part of Brittany that is marketed as the Bretagne Sailing Valley because of the huge impact that sailing has on the local economy (see the tweet below). #YRF2018 We published a study “The economy of competitive sailing in Brittany”. Key figures : 162 businesses identified, representing sales of €205 million including €56 million directly linked to the competitive sailing sector. Taking the forum to Lorient was an excellent decision, but taking it there just a fortnight before the start of the Route du Rhum was a master stroke. Thanks to the location and the timing, the organisers attracted dozens of the key players involved in the race, including a good number of the actual sailors. Among those attending the forum just two weeks before their single-handed race across the Atlantic were two household French names, Armel Le Cléac’h and Loïck Peyron. Completing the star-studded line-up were some of the biggest names in the history of sailing, including former Route du Rhum and Vendée Globe winner Michel Desjoyeaux (for my British readers unfamiliar with sailing, it was Michel who pipped Ellen MacArthur to win the 2001 Vendée Globe), Alain Gautier and Franck Cammas. Several talks addressed the divide between sailing in France and in the rest of the world and discussed how it can be bridged. The main differences that casual viewers will notice is that single-handed racing is far more popular in France than in the rest of the world. The way French sailing operates to some extent in a bubble, separated from the rest of the world, is both a blessing and a curse for a French-English sailing translator. On the one hand it means that plenty of material is written in French. However, because French sailing attracts such a large domestic audience, it often seems like there is little interest in attracting a more global audience by translating material into English. When translation does take place, it is often a half-hearted effort, on a budget too small to produce the kind of quality that will be taken seriously. Those in the French sailing industry clearly understand the importance of producing well-written material, as their French copy is always excellent. The challenge, for me, is to convince them that, just as they invest in professional writers for their French documents, they should do the same for their English translations if they want to attract more customers in the English-speaking world. There was plenty of discussion about the World Sailing meeting that was taking place the following week, especially regarding which events would be added or removed to the programme for the Paris 2022 Olympic Games. Based on the discussions that took place in Lorient, the vast majority of people at the Yacht Racing Forum would have been delighted to hear World Sailing’s announcement that the Paris 2024 Olympics will include an offshore event. The forum is an opportunity for event organisers to showcase their events. This year, Mateusz Kusznierewicz, of the Star Sailors League, presented the Nations Gold Cup, a novel competition that seeks to tap into the way events like the FIFA World Cup bring together entire nations in support of their teams. National teams will compete against each other in one-design boats. The format of the qualifying competition will ensure that some emerging nations will take part in the final phase. One of the many innovations showcased during the design symposium was the idea of using elliptical rigging. Jonathan Duval of Future Fibres presented research showing that elliptical rigging reduces drag. He also showed an excellent video demonstrating the strength of multistrand rigging. In offshore racing, marginal gains can make a huge difference in an offshore race lasting several weeks, so I’m sure it won’t be long before the world’s fastest yachts start adopting these new technologies. As was the case two years ago in Malta, foiling remained a hot topic at the 2018 forum. Earlier in the year it had been announced that foiling monohulls would be used for the 2021 America’s Cup. The AC75 boats raised quite a few eyebrows when they were unveiled, and are bound to attract a lot of media interest when racing gets under way thanks to the innovative design, with one of the two foils hanging above the water. Hydrofoils are now being fitted to more and more boats and are becoming more accessible. One of the companies in the exhibition area was SEAir, a French firm that manufactures RIBs that can foil smoothly over the water at speeds of just 15 knots. SEAir was just one of the many companies and organisations with a stand. One company presenting a particularly interesting and unique concept was ALL4ONE Consulting. Based in Belgium, ALL4ONE organises a business game based around the sport of sailing. Teams take part in a sailing race simulation and must work together to strike the right balance between taking risks and achieving goals. The exhibition area is also an opportunity for me to meet my existing clients. This year, I was able to meet Charlie Carter at the Spinlock stand. Charlie had contacted me a few weeks earlier in the year asking me to translate the Spinlock’s trade guide. As was the case two years ago in Malta, there was no shortage of networking opportunities, including during the coffee breaks, lunch breaks, the drinks reception, and the gala reception at the fabulous Cité de la Voile Eric Tabarly. As I explained earlier, the venue was in the heartland of French sailing, and MaxComm made sure we made the most of our trip to the region. Its partner, Bretagne Développement Innovation, organised three tours of local companies operating in the sailing sector. I chose to go on the tour to Vannes as it meant I could visit some of the companies who work with Spindrift 2: North Sails, VPLP and Multiplast. The one negative side of going to Lorient is that getting there was quite a challenge for many of us. I had to fly to Roissy then take a train to Orly to get a connecting flight to Lorient. To make matters worse, the plane taking me to Paris on the way back was diverted to Quimper, so we had to travel there by road to get our flight. Getting to Bilbao will be much easier, as the airport is much better connected to the rest of Europe. Expectations will be high after such an excellent, well-organised event in Lorient, but I’m sure the team at MaxComm will put on another great show next year in the capital of Biscay. As a translator who has now been specialising in sailing for over three years, I thought it was about time I spent some time out on the water myself, learning how to sail and seeing first-hand what all the terms I use mean, so I signed up to Good Hope Sailing Academy‘s Competent Crew course. We had some theory classes, but it was mainly a practical course, out on the water. The first two days we didn’t get far out of the harbour, because the wind was too strong for us novices, so we spent quite a lot of time on the theory. On day 3, however, we sailed much further, and on day 4 we went right out to Robben Island. The experience has been thoroughly enjoyable, thanks in no small part to the other students and our excellent skipper/teacher Digby. As you can see, the views of Table Mountain and the surrounding hills from the water are pretty awesome! A brief moment to relax as we close-hauled back towards Cape Town on a starboard tack. Terminology was an important part of the course, which is one of the reasons why I signed up. The terms we learned were related to the parts of the boat, the names and parts of the sails, the points of sail and manoeuvres, among others. Many of the terms were ones that I was already familiar with, having used them in my translations, but it was helpful to see those terms in practical use, and it was reassuring to hear the captain use certain terms and expressions in the same way that I had used them in my translations, confirming that I’d used good sources when researching terminology and collocations. For example, hearing the skipper say “Shake out the reef” provided welcome reassurance that I use the correct expression to refer to the removal of a reef (i.e. a fold) from the mainsail. I also learned dozens of new terms, such as cleats (fittings used to secure lines), stanchions (the vertical posts to which the guard rails are attached), clew (the corner of a sail between the foot and the leech, or back edge) and to pinch (to sail too close to the wind, as a result of which the sail begins to flap). Translators will tell you that one of the causes of a poor translation is that the translator has not understood the text. Thanks to this Competent Crew course, I will better understand the texts I will be translating and will be more aware of how to use the terms and expressions in English. I also believe it will help me better engage with conference attendees when I attend sailing conferences, since I will be able to better understand the conversations between session and participate in them. On day 3 I was feeling a little unwell, and at one point I actually felt like I didn’t want to ever sail again! But I caught the bug again on day 4, and perhaps at some point in the future I’ll sign up to the Day Captain course! This month, I finally got hold of my copy of La traduction, un sport de haut niveau (“Translation, a high-performance sport”), which is the title given to the June edition of Traduire, the journal published by the Société française des traducteurs. It was published way back in June 2016, but with moving house it got sent to my old address and I didn’t get hold of it until October this year. It was the first time I had subscribed to the magazine, not because I was not interested, but because I wondered when I would find the time to read it. But edition 234 was dedicated to sports translations, a field in which I specialise, so I was looking forward to reading it. There was a mixed bag of authors: some who focus only on one or two sports, some who translate other fields in addition to sport, and some who are translators who dedicate much of their free time to sport. In Traduire à vélo, which I will liberally translate as “The pedalling translator”, Jonathan Hine (website, blog) begins by telling a short story. He then tells us about his life as a nomadic translator who travels around North America and Europe by bicycle. Interestingly, Jonathan says that his professional profile on the American Translators Association‘s website is by far his main source of new clients. Jonathan discusses many of the difficulties encountered by nomadic translators. Whenever possible, he stays in accommodation with WiFi, though he can use his smartphone if all else fails. Given his nomadic lifestyle, it is surprising that he did not get his first smartphone until 2014. He does rent a small flat in Italy that he uses for storage or for receiving items in the post (though more often that not, he has parcels sent to friends or hotels). If Jonathan ever wants to cycle around Southern Africa, I could recommend a few routes in South Africa and Namibia! He ends his article with a list of pros and cons, which anyone considering becoming a nomadic translator would do well to read before taking the plunge. In Le cauchemare des interprètes, or “The interpreter’s nightmare”, Laurent Laget (website) writes at length about the man we all love to hate, pantomime villain José Mourinho. Mourinho is known for speaking half a dozen languages, and according to Laget, “Mourinho learned Catalan” when working for FC Barcelona as Bobby Robson’s interpreter. However, like the late Johan Cruijff, despite learning to speak several other languages Mourinho has never been heard speaking Catalan in public. He certainly learned to understand Catalan, as evidenced by interviews in which the journalist asked him questions in Catalan and he responded in Spanish, but when he went to Real Madrid, he started refusing to answer questions posed to him in Catalan, saying he did not understand. Laurent looks at some of the press conferences in which Mourinho has reacted to the intervention of the interpreter. In one instance, Mourinho protested after “we didn’t deserve to win” became “we deserved to win”! By contrast, on another occasion, Mourinho was so impressed by the efforts of a Romanian translator that he chirped: “Who pays this guy? His salary should be doubled!” Laurent also mentions that some of Mourinho’s opponents use “translator” as a taunt, as if to insult him. We should applaud how Mourinho responded on one occasion: “Don’t call me a translator because that would be an offence to every translator.” Laurent’s insightful article concludes with some thoughts on how learning a foreign language is beneficial to players’ integration. He concludes by saying that languages are a powerful tool for integration, which benefits a player’s well-being, and therefore his or her performance on the field. In Golf et traduction : de la page blanche à la balle (literally “Golf and translation: from the blank page to the white ball”, but the French title works better as it uses the same word for “blank” and “white”! ), Céline Graciet (website) talks about how she enjoys playing golf and draws parallels between golf and translation. According to Céline, the concentration skills she uses on the fairways and greens (and perhaps occasionally in the rough or the bunkers!) are extremely helpful when she is sat at her desk, and she says that playing golf makes her more productive. Recently, Céline is delighted to have been regularly translating documents for a new golf club. Over the page I found a very familiar name: that of Simon Berrill (website, blog). I skipped past L’art du cliché, not because I wasn’t interested in what Simon had to say, but because I’d already read The right clichés — the original from which this French text was translated — on Simon’s blog. Simon mentions the abundance of clichés in sports writing and how using corpora can help translators working on a text about a sport with which they are less familiar. He suggests building corpora using WebBootCat and analysing it using one of my favourite tools, AntConc. Next up, Taffy Martin discusses cross-border athletics in L’athlétisme à travers les frontières. She focuses mainly on the differences between how athletes spend their formative years in France and in the United States, but I think the most interesting part is where she looks at athletics terminology. Taffy notes that certain event names in English have evolved to reflect international usage (a precursor to euro-English in the EU institutions? ), such as broad jump and hop, step and jump becoming long jump and triple jump, respectively, as a result of which the French event names are transparent to English readers. As a translator working for the IAAF, Taffy was asked to translate articles from English to French, i.e. from her mother tongue to her second language. She talks about an article she agreed to translate about race walking, and notes how certain terms used in English for both running and race walking have two different translations in French. For instance, both disciplines use the term stride in English, but French uses foulée in running and pas in race walking. This situation, where a term in the source language can be translated by two different terms in the target language, depending on the sport, is a common occurrence that sports translators must be wary of. Simon Berrill’s article (see the previous paragraph) gives an example in the opposite direction: the translation of the French word arbitre is referee in some sports (football, rugby, boxing…) and umpire in other sports (most racket sports, but also some ball sports like netball and hockey), the choice between the words being somewhat, ahem, arbitrary. Back in 2003, Taffy worked in a team of around 15 voluntary interpreters at the 2003 World Championships at the Stade de France (I, by the way, was there too, sat high up in the stands for the entire week watching the action!). She talks about the challenge of helping illiterate athletes, often with broken English, during drug tests. With all the money in sports like football and Formula 1, it is often easy to forget that many sports, including athletics, rely on huge numbers of volunteers, and an event like the World Athletics Championships could not take place without them. Translators need to bear in mind crude economic realities when looking for job opportunities. Hiroko Nakao (website) writes about working as Une correspondante sportive dans l’abîme du décalage langagier (“A sports correspondent in a language gulf”). Hiroko, a Japanese sports translator who works mainly in football, discusses the “often extremely short deadlines” she faces, which is something that I think all sports translators can identify with. Hiroko worked for five years as a sports correspondent, mainly covering a French football club’s takeover by a Japanese company on behalf of a Japanese sports newspaper, with a role that was far broader than that of a translator and interpreter. She mentions an incident in which the newspaper had changed a word used to refer to a substitute to make the article shorter, but the changed word had negative connotations that had left the club chairman fuming. After that incident, Hiroko would always leave a note at the end of each report specifying that the taboo word should not be used. Vanessa De Pizzol interviews Patrick Kendrick (website, blog), who is both a football interpreter and a sports commentator. (Is anybody as jealous as I am?) He had been told by one of his university interpreting lecturers that football press conferences are organised by clubs, who hire their own interpreters, often through agencies, and it is through a specialist football-interpreting agency that he began working as an interpreter in football. Asked about José Mourinho, Patrick mentions two positive experiences working with him. Regarding the role of the interpreter, Patrick says that when a manager says something controversial in a press conference, the home club’s press secretary might sometimes ask the interpreter not to translate it. Patrick began working as a commentator when, after moving to Milan, he was asked to provide English commentary for the Italian league. He loves both careers and hopes that he will never have to choose between the two. In Traduction sous adrénaline (“Translation on adrenaline”), Heather Watson (website, blog) discusses her role translating and interpreting (though officially as a “press officer”) for the sport of motorcycling, which is dominated by Italian teams, but has racers from all over the world. Like Hiroko Nakao, Heather mentions the “extremely tight publication deadlines”, with press releases that need to be completed in half an hour. She notes that translating for Twitter and for video subtitles has improved her ability to write concisely. As an interpreter, Heather says it is vital for her to know the technical terminology used in her sport, especially where two terms might be easily confused, such as forcella (the fork to which the front wheel is attached) and forcellone (the swinging arm to which the rear wheel is attached). She also mentions pseudo-English words that are misused, such as feeling, which she normally translates using a paraphrase referring to being in sync with the bike. Idriss Chaplain (website), who translated the autobiography of four-time Tour de France winner Chris Froome into French, says that sport is a much-maligned field in translation faculties, where lecturers rarely decide to work on sports translations, despite sport playing such an important role in today’s society. In his article, La passion, la tête et les jambes, Idriss recalls his surprise when he heard Laurent Laget tell an audience that sports translators regularly average 10,000 words a day! I have to say that I too am surprised, as I cannot recall ever translating quite that many words, though I have often had to translate around 1,000 words in about an hour. Sports translators often spot mistranslations made by non-specialists, and Idriss gives an example of the term clean sheet, which, during his master’s degree, many of his classmates translated as blanchissage, rather than writing cage inviolée. This is what Simon Berrill means when he refers to the importance of finding the right cliché. Emmanuelle Hingant, whose Twitter feed includes a Tweet about a translation she did for the Irish National Ploughing Championships (yes, really! ), also touches on the subject of clichés, or phrases bateau as she calls them, in Les mots du football : viser juste et respecter le jeu (“The words of football: aiming properly and playing fair”). By way of example, she mentions the number of times that the phrase “À la fin de la journée” crops up in translations of interviews, a mistranslation of “At the end of the day”. Emmannuelle says she usually has no problems translating player interviews, but sometimes struggles translating the words of managers who use long-winded answers to express a single idea. She gives an excellent example from an interview with Roy Hodgson when he was the England manager. “It’s better to try to reproduce the idea, rather than translating each sentence word for word,” she says. Like me, and probably most sports translators, Emmannuelle finds errors in most of her source texts, and she agrees with me that we should point out such mistakes to the client, who expects us to do so. She adds that the only way for a translator to be able to point out certain mistakes in football texts is through “knowledge of the history of football, and knowledge of results, the Laws of the Game and the league tables”. Elisabeth Monrozier (website) writes about Les anglicismes dans les sports de glisse. But what are sports de glisse? It is a term I first came across when I began working in sailing, and refers to a myriad of sports in which people slide across a surface, such as water, snow or ice, or even through the air. The term is a tricky one to translate because it is a case where French and English simply categorise things differently to each other. If you search for translations online, a common suggestion is boardsports (see this Proz answer and see the English language link on the French Wikipedia page). But remember where I said I first read the term: sailing. But although sailing is considered a sport de glisse (the boat slides across the water), it is certainly not a boardsport! For me, there is no one solution that fits every circumstance. You normally need to reword your translation based on the context. Moving back to Elisabeth’s article, whose title I’ll translate as “Anglicisms in urban, nautical and winter sports”, the author looks at the influx of Anglicisms in new sports that emerged in the 1980s and 1990s, such as freestyle and freeride (the kind of events you see in the X Games. Elisabeth explains that one reason why Anglicisms abound in these sports is because of the informal way in which the sports arose, without national sports federations to provide standardised French translations. Instead, there was a “community spirit”, and the translator, argues Elisabeth, can help the author be perceived as a member of that community by carefully choosing to use certain Anglicisms. She refers to three different situations: terms that have a single exact equivalent in French, terms that have a French equivalent used alongside an Anglicism, and terms that have no French equivalent. Prenons par exemple la figure consistant à sauter en réalisant un tour complet sur soi-même. Réalisée avec un skate, elle s’appelle un three sixty, mais se le sportif est chaussé de skis, c’est un trois-six. First, we have another example of the same term in one language having two different translations in another, depending which sport is being referred to. In French, a three-sixty is called a trois-six when performed on skis, but a three-sixty on… On what? One might logically assume that skate refers to skating or skates. But skating is normally called le roller (except on ice, when it’s called le patinage). Le skate refers not to skating but to skateboarding! French tends to shorten many of the Anglicisms it adopts. Usually, though, this shortening of words merely involves dropping the -ing, so when Elisabeth’s article refers to the sports surf, ski, snowboard and windsurf, it is discussing surfing, skiing, snowboarding and windsurfing, respectively. So you would expect skateboarding to be le skateboard, but it is further shortened to le skate. Elisabeth briefly discusses the illogical gender of some of the borrowed words from English, such as le team, even though équipe, the French word for team, is feminine. She then concludes that there are no hardfast rules and wisely advises sports translators, and translators in any field, that “the best glossary out there is no replacement for meticulous research”. Laura Orsal (website) writes about translating for the sports press, particularly texts about running, in Traduire pour la presse sportive : l’exemple de la course à pied (“Translating for the sports press: the example of running”). According to Laura, translations of articles about running are usually for a well-informed audience looking for “tips on training, food and equipment and nice stories to inspire and motivate them”. Like Elisabeth Monrozier, Laura notes the strong US influence on the language used in French, the perfect example being the influx of the English word run and its derivatives in the names of French blogs and magazines. One issue the sports translator must face, says Laura, is the constant introduction of new concepts. She gives the word priming, which refers to a training technique, as an example. This term has been translated into French as amorce. Laura also discusses innovations in equipment, including clothing and footwear that incorporate “patented technologies with untranslatable names”. Laura gives CrossFit as an example of a discipline in which Anglicisms are abundant, mentioning the terms kettlebell, skills, metcons, and providing definitions of all three in the footnotes. Laura says that being a runner herself helps her understand the jargon, and therefore the text, and her examples of how to translate certain concepts prove that her knowledgeable about running is profound. She concludes by saying that sports translations “require excellent knowledge of the sport you are translating”. Having myself translated texts about sports I am less familiar, such as handball (and sailing when I first started working on sailing texts), my viewpoint is more in line with that of Idriss Chaplain (see above), who says that even when dealing with an unknown sport, someone who is familiar with sport in general will “assimilate the jargon much more easily, and turns of phrase will come more naturally”. However, I agree with Laura that by practising a sport (or, may I add, specialising in translating a specific sport) saves time when working on a text in that sport. I would like to congratulate SFT for this fascinating edition of Traduire, which I advise any current or budding sports translator to read. The digital version will be freely accessible online from June 2018. Idriss Chaplain mentioned sports translation being largely ignored in translation faculties, but it is also largely ignored by translation associations too, so I applaud the Société française des traducteurs for their initiative in organising this special edition of Traduire. Are you a sports translator? Unfortunately sports translation is a field ignored not only by faculties, but also by translation associations. I can’t remember ever hearing about any event or even a talk at a conference that specifically addresses sports translation. I already know around a dozen sports translators, but would love to hear from a few more, and perhaps one day organise a day of talks, maybe through a translation association. If you’re a sports translator, please drop me a line, either in the comments section or using the contact details on my website. Two and a half years ago I received a phone call out of the blue to discuss long-term collaboration translating material for Spindrift racing, a sailing team run by Yann Guichard and Dona Bertarelli. I’ve always been passionate about sport, so this was a dream offer for me. Exciting projects awaited. A year earlier, the team had bought a record-breaking boat called Maxi Banque Populaire V, and would soon attempt to set a new transatlantic record on her, after rebaptising her Spindrift 2. A year later, having already won the famous Route du Rhum race from Saint-Malo to Guadeloupe, they would embark on an even more exciting challenge: attempting to win the Jules Verne Trophy for the fastest ever circumnavigation of the world. Spindrift racing contacted me after finding my website while searching for a specialist sports translator. I was over the moon. It felt like all the hard work I’d put into rebranding myself and marketing myself as a sports specialist had finally paid off! My contact asked me to do a 600-word test translation, which she happily reduced to around 300 words when I said that 600 was more than I was willing to do for free. I know some translators get very upset at requests for translation tests, but I’d have been mad to turn down a dream offer like this based on a request that would take me no more than two hours to fulfil, especially for a potential client interested more in my expertise than in my rates. I sent off the test, and my client agreed to work with me at my proposed rates. The translations were quite tough going at first, and at times it felt like I was sailing into a headwind. In the past, I’ve managed to apply my knowledge of the sports that I follow to sports with which I’m not familiar. For instance, while covering the World Handball Championships many years ago, I would use many of the same turns of phrase that I might use if reporting on a football match. I basically just had to learn a few new terms, such as names of positions. Sailing, however, was a whole new kettle of fish, with a language all of its own. I already knew that boats have a starboard and a port side, rather than left and right. I also knew that a boat is always a she, never an it, though it’s easy to forget this when you’re translating from French, since you’re so accustomed to translating the masculine pronoun il as it when referring to an inanimate object. (I can’t think of any other contexts where il would be translated as she!) Many other terms, however, were new to me, so the learning-curve was steep. I’ll discuss some of the specialist vocabulary in a future post. Over time I became more familiar with sailing-specific vocabulary and expressions, whether referring to parts of the boat, types of sails, directions on the boat, or manoeuvres, and I no longer spent so long doing research while translating. I therefore decided to start marketing myself not only as a sports specialist, but specifically as a sailing specialist too. I also began to attend boat shows, looking for potential clients to whom I could sell my newly acquired expertise. The entry fees for boat shows are pretty cheap, and I could fly from Barcelona to the venues for less than €70 return. For the Geneva show, I flew to Switzerland in the morning and returned to Barcelona in the evening, all for around €50. The biggest investment was therefore the office hours lost. Unfortunately my efforts did not bear tangible fruit, as I failed to secure any new clients in the sector. The main reason, I believe, was that I was not meeting the people who actually handle translations. Besides, the boat shows had a strong focus on the leisure side of yachting, rather than solely on yacht racing. It would have been easy to give up at that point and not bother attending any other sailing events. But then I heard about the Yacht Racing Forum, held this year in Malta. Not the cheapest or easiest place to get to, especially from where I was now living, and the delegates’ fee was far more expensive than entry to a boat show. But I couldn’t resist the opportunity to go to an event that would be attended by those involved in yacht racing, from boat owners and sailors to communications managers and magazine editors. More about the content of the Forum will follow in a future post. My persistence paid off. I’ve not landed any new projects yet (it only ended a few days ago), but I’ve learnt an awful lot about sailing, how the industry works, and which people purchase translation services. I can now adopt a more targeted approach to pitching, and I’m expecting to receive a few phone calls or e-mails from people who asked me for my card as soon as I told them what I did. Delegates I spoke to were particularly impressed by the fact that I specialise in sailing, with one woman from a communications company lamenting some of the awful translations she has received from translators who know nothing about sailing. As mentioned above, I’ve attended many client events that have borne no fruit in terms of new clients. Perhaps the same is true for you. However, I’d encourage you to persevere, because the types of clients you find at such events often provide regular work at good rates, so when you eventually do acquire a new client, the investment will pay off. I would, however, recommend trying to target the events you attend carefully. Try to see who will be attending, and aim to go to those where you’re likely to meet purchasers of translation services. To give an example from my other specialist field, macroeconomics, two years ago I found out about the International Conference on Economic, Business, Financial and Institutional Translation. I wasn’t too keen on going, due to money I felt like I’d wasted on previous events. However, when I saw that people from the translation departments of international financial institutions (IFIs) would be there, I decided to attend. It was an excellent decision. I spoke to the head of an IFI translation department, told her about the extensive work I’d already done for the OECD, and as a result of that conversation I’ve earned a five-figure sum from that client! So keep attending events, but target the ones where you’ll meet translation purchasers. Anglo Premier specialises in sports translations. More information at www.anglopremier.com/sport. There are some excellent online resources for vocabulary related to the Olympic Games in English, French, Spanish, Catalan and Portuguese. For French and English, the France’s National Institute for Sport, Expertise and Performance produced an excellent glossary for the 2012 Olympics and Paralympics. The Fundación del Español Urgente has produced an excellent guide for journalists, the main focus being to avoid the unnecessary use of English terms. Termcat produced a large glossary when Barcelona hosted the 1992 Games, and has continued to develop the glossary ever since. Its Diccionari de l’Esport includes terminology in English, French, Spanish and Catalan for all the Olympic disciplines, as well as for many non-Olympic sports. Finally, for those who work with Portuguese, the Grupo de Pesquisa em Estudos Olímpicos has produced an English-Portuguese glossary for the Games in Rio de Janeiro, available here. Anglo Premier Translations collabore avec Spindrift racing depuis le mois de juin 2014. Le plus gros défi a eu lieu au mois de septembre. Ou plutôt “les” défis. Car si traverser l’Atlantique en solitaire dans un maxi-trimaran est un challenge de premier ordre, il l’est aussi être disponible 24 heures par jour pendant une semaine pour traduire toutes les dernières informations du français à l’anglais. Pari réussi pour les deux! Car si Spindrift racing a fait une magnifique course, en terminant 2ème sur la Route du Rhum, Anglo Premier Translations, lui aussi, a été à la hauteur, avec la réactivité qui est nécessaire dans cette époque où tout le monde veut avoir un accès instantané aux dernières informations dans sa propre langue. Pendant plus d’une semaine, Anglo Premier Translations a traduit toutes les informations – reportages et vidéos – publiées sur le site web de Spindrift racing. Au total, plus de 11.000 mots traduits dans des très courts délais au long des 8 jours de course. Nous attendons avec hâte la prochaine course de Spindrift racing pour pouvoir répéter ce partenariat. In Part I of this series I discussed the expression the beautiful game used to refer to association football (which I will simply call football in the rest of this post). In this part I will look at the terminology mentioned by Joseph Lambert in his own blog post, The Terminology of the Beautiful Game. The first half of the following table shows the terminology mentioned by Joseph Lambert in English, French and Italian, to which I have included the equivalents in Spanish and Catalan and English definitions. Entries marked with an asterisk are not specific terms, but are ordinary words that could be used to describe the same situation. The second half of the table contains additional interesting terms, and are discussed further below. petit pont tunnel túnel túnel nutmeg When the ball is played between the legs of an opposing player. caviar *peach, *gem An exceptionally good pass. doppieta doblete doblet brace, double, pair Two goals by the same player. coup du chapeau tripletta hat-trick, triplete hat-trick, triplet hat-trick Three goals by the same player. poker póker pòker Four goals by the same player. pokerissimo, manita manita maneta *score five, *thrashing, *thrash, *cricket score, *trounce Five goals, but not necessarily by the same player. but [goal] gol gol gol goal If you don't know what a goal is you probably won't be interested in this article! corner corner, calcio d'angolo córner córner corner Ditto! córner olímpico córner olímpic *goal (straight/directly) from a corner, *score (straight/directly) from a corner When the ball goes straight into the goal from a corner, without touching another player (except perhaps a small touch by a goalkeeper). arbitre referí, árbitro àrbitre/a referee The main official in charge of a match. vuelta olímpica lap of honour When players walk around the edge of the pitch, celebrating in front of their fans. cucchiaio, pallonetto vaselina vaselina chip A short, high kick going over the head of an opposing player or over the arms of the opposing goalkeeper. Also used as a verb. grand pont *autopase *autopase *beat, *go (a)round When a player knocks the ball past an opponent on one side and runs around the other side of him or her. lucarne escuadra escaire top corner The area just inside where the crossbar and post meet on the goalposts. prolongation prórroga pròrroga extra-time An additional 30 minutes of play in knockout matches when the scores are level at the end of ordinary time. temps additionnel prolongación, descuento, tiempo añadido prolongació, descompte, temps afegit injury time, stoppage time, time added on Additional time added by the referee to compensate for time lost due to injuries, substitutions or time-wasting. Joseph’s article does not offer a translation of manita. I believe there is no specific term in English. We would either say that a team scored five or use an expression that refers to the fact that a team were well beaten, such as the verbs thrash or trounce. The expression cricket score is often used when a team is banging in the goals. A commentator might say ‘At one stage Arsenal looked like they might make it a cricket score‘. For those unfamiliar with cricket, this is an exaggeration. Even the lowest innings score ever in first-class cricket is 26, but normally a cricket score would be in excess of 150. An interesting term in Spanish (and Catalan) is córner olímpico, literally an ‘Olympic corner’. In English we have no such term, so we’d just have to say that a player ‘scored straight from a corner’. According to Nicolás Alejandro Cunto’s blog, the term was coined when Argentina scored such a goal against Uruguay in 1924. The Uruguayan team had recently won the gold medal at the Olympic Games in Paris, where they celebrated with a lap of honour, which in Spanish was dubbed a vuelta olímpica – an Olympic lap or tour – a term still used in Spanish – and in Catalan – to this day. The same article by Nicolás Alejandro Cunto illustrates the much higher proportion of words borrowed from English in Latin American Spanish than in Spanish Spanish. He uses referí (referee) rather than árbitro and wing (winger) rather than lateral. Another curious Spanish term is vaselina, literally meaning ‘Vaseline’, to refer to what in English we call a chip. In English the word chip is often used as a verb rather than a noun, so ‘marcó con una vaselina’ might become ‘chipped the ball (over the goalkeeper’s head and) into the net’. Joseph’s article mentions petit pont (small bridge), the French term for a nutmeg. French football parlance also has the grand pont (big bridge), which is when an attacking player knocks the ball past a defender on one side and then runs around the other side of the defender. (If you’re confused by this explanation, watch this exquisite ‘grand pont’ and goal by an 8-year-old called Adam, and if you’re not confused, watch it anyway!) There is no term as precise as this in English. Although a translator could describe the action precisely by explaining the manoeuvre in detail, this is a good example of where it is better to let some information become lost in translation in the interest of maintaining good style (e.g. ‘Ronaldo beat Johnson on the right flank before unleashing a cross to the far post…’). French refers to the top corner as the lucarne (skylight); Spanish and Catalan use escuadra and escaire respectively, both meaning ‘right angle’. The closer the ball is to the junction between the crossbar and the upright, the more likely a French writer or commentator is to say en pleine lucarne (‘right in the top corner’, or ‘in the very top corner’). Finally, translators working between French and Spanish or French and Catalan should watch out for a false friend when referring to extra time and injury time (see the table for other synonyms). Extra time is called la prolongation in French, but in Spanish and Catalan prolongación and prolongació mean injury time; extra time is called prórroga and pròrroga respectively. I recently stumbled upon an article by fellow specialist sports translator Joseph Lambert entitled The Terminology of the Beautiful Game. Joseph focuses on terminology in his source languages: French and Italian. My source languages are slightly different – I also translate from French, I don’t translate from Italian, and I translate from Spanish and Catalan – so with his permission I decided to write my own post incorporating his French and Italian terms and adding Spanish and Catalan terms. I will examine the terms he discusses in a future article. In this post I will look at an expression used in the title of Joseph’s article. The term the beautiful game is instantly understood by English-speaking football fans – at least those in the UK and Ireland – as referring to association football, in the same way that boxing fans will instantly recognise the noble art as referring to their sport. Schott’s Sporting, Gaming & Idling Miscellany, by Ben Schott, lists three other poetic nicknames for sports: the sport of kings (horse racing), the gentle craft (angling), the noble science of defence (fencing) and the Tesserarian art (gambling). The expression the beautiful game has no direct translation into French, Spanish and Catalan, so a translator working from English into these languages must either repeat the word football or use some other expression to refer to the sport. Spanish has the option of using the calqued translation balompié, which the Diccionario Panhispánico de Dudas says “no ha gozado de mucha aceptación entre los hablantes y suele emplearse casi siempre por razones estilísticas, para evitar repeticiones en el discurso” (it is not widely used, and when it is it is nearly always for stylistic reasons to avoid repetition). French, meanwhile, can resort to the expression le ballon rond, which literally refers to the bag of air being booted around the field but is often used as a metonym to refer to the sport. French can also use the slightly informal shortened form foot (French can also remove the suffix -ball from the names of two other sports: handball and basketball). Another alternative in English is soccer, a word that derives from association football (see next paragraph). I remember soccer being in widespread use when I was growing up as a child in England, but in recent times – perhaps particularly since the 1994 World Cup in the USA – it seems to have fallen out of favour in the UK, wrongly branded an unwelcome Americanism by many; the term was first coined in England. Generally it is used only in headlines (where there is a limit on the number of characters) or when specifically discussing football in America. Association football is the official name of the sport, so called because it is based on the rules originally devised by the (English) Football Association. The full name is used in contexts where it is necessary to distinguish the game from other codes of football: rugby league, rugby union, American football, Canadian football, Australian-rules football (or Aussie- rules football, commonly referred to as footie in Australia) and Gaelic football. Technically the full name of the sport in French and Spanish is football association and fútbol asociación respectively – and FIFA actually stands for Fédération Internationale de Football Association – but these are rarely, if ever, used in those languages. Note that in English it is not unusual for a rugby (league or union) commentator to say something like “that’s excellent football by England” or “that’s excellent use of the football by Wales”. Watch this space for a follow-up post on vocabulary used to describe the action during matches. Anglo Premier Translations specialises in sports translations. For more information, visit the main website. This is the first of a series of articles I will post about the pronunciation of foreign names. The articles will focus on famous names in sport that are often mispronounced by sports commentators and presenters. Commentators and presenters should not be expected to pronounce all foreign names exactly as pronounced in the original language. For instance, it would sound pretentious for commentators to pronounce all French Rs the French way. But they should pronounce names as correctly as possible using phonemes (sounds) that exist in English. Mispronunciations are often the result of the speaker reading a name as if it were English. But sometimes they occur because the speaker applies the pronunciation rules of one foreign language to a name that’s from another language – usually French, because it is the most familiar foreign language to most people in Britain. For example, when referring to the controversial Uruguayan footballer Luis Suárez, Liverpool’s manager Brendan Rodgers calls the striker LEW-ee, with a silent S. He does this three times in the following interview alone. This is a type of hypercorrection, and specifically a hyperforeignism: even though a final S in English words is pronounced, Rodgers believes he is pronouncing the name more correctly by omitting it, when in fact he is not. He almost certainly does so because the French name Louis has a silent S, but final consonants are not silent in Spanish, nor are they in most languages. The correct pronunciation would be LWEES, as a single syllable, but since this is hard to pronounce for an English speaker, an acceptable compromise would be lu-WEESS. Let us look specifically at the subject of this post, the letter J, which is pronounced in a variety of ways in different European languages. Mispronunciations of a Catalan J are invariably a hyperforeignism, since the letter is pronounced the same as in most English words (e.g. in the word jam). Sometimes commentators wrongly pronounce it like the J found in other Germanic languages (i.e. a Y sound). For example, during the playing days of Jordi Cruyff, who was given a Catalan first name by his parents (his father Johan was a Barça player at the time), the British media usually pronounced his first name as YOR-di. Perhaps commentators assumed his first name was Dutch, but other Catalan names with a J are also mispronounced as a Y, such as Jordi Alba. Other times they pronounce it like the Spanish J (see below). Here’s a clip of Stephen Fry in flagrante delicto pronouncing the Catalan word menja as MEN-ha, as if it were a Spanish word, when the correct pronunciation is simply MEN-ja. An Anglicised pronunciation of the Spanish name Jorge would therefore be HOR-hay. This pronunciation of the letter J (and the letter G if followed by an E or an I) is unique to Spanish, and should not be used for names in other languages, including Catalan. The spellings of Spanish, Portuguese and Catalan names are often very similar or identical (José is written the same in Portuguese and Spanish), so commentators should make sure they know whether athletes have a Spanish, Portuguese or Catalan name so they can pronounce it correctly. Common Spanish names containing a J pronounced as a H sound: Alejandro, Alejandra, Jaime, Javier, Javiera, Jerónimo, Joaquín, Jorge, José, Josefina, Joel, Juan, Julia, Juliana, Julio. Common Catalan names containing a J pronounced like an English J: Jaume, Jeroni, Jordi, Joaquim, Josep, Joel, Joan, Júlia. Common Portuguese names containing a J pronounced like a French J: Jaime, Jerónimo, Jerônimo, João, Joaquim, Jorge, Josefina, Júlia, Júlio. Finally, Juventus is a special case. In Italian, the letter J is only used in words borrowed from foreign langauges. Otherwise, the J sound (as in jam) is always represented by the letter G (Genova) or by the combination “GI” (Giuseppe). The name of the Turin-based club is derived from the Latin iuventus, meaning youth, and is pronounced yu-VEN-tus. Anglo Premier Translations és patrocinador oficial de I Open de Tennis de Taula de Sant Quirze del Vallès, que tindrà lloc el 16 de juny de 2012. D’aquesta manera recolzem un esdeveniment que contribueix a fomentar la salut al nostre entorn local a través de l’esport. L’Open consisteix en un torneig per a federats, un altre per a no federats, i un tercer per a escolars, de manera que sigui quin sigui el teu nivell, hi pots participar. Podeu fer la inscripció a través del web del club organitzador, el club de tennis de taula de Sant Quirze del Vallès. T’hi atreveixes? 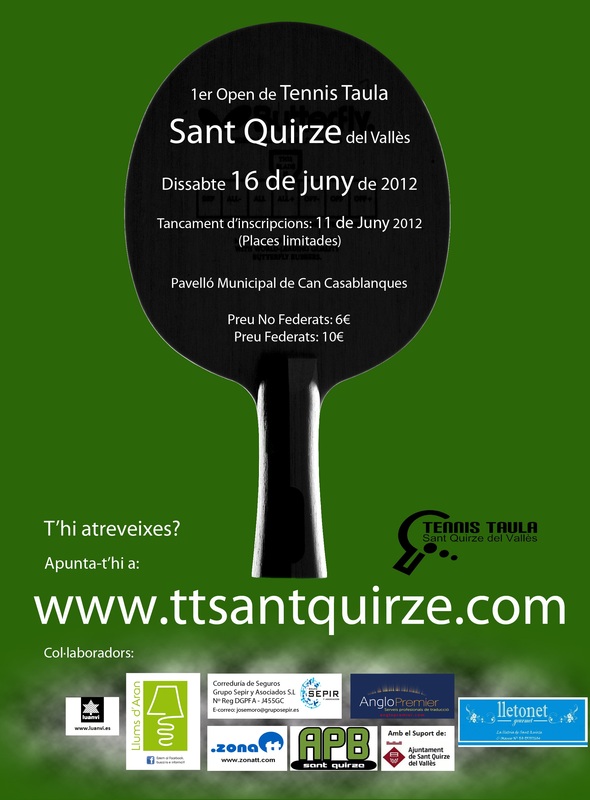 Anglo Premier Translations is an official sponsor of the inaugural Sant Quirze del Vallès Table Tennis Open, which will take place on 16 June 2012. In doing so, we will be supporting an event that promotes good health through sport in our local community. There is a tournament for league players, non league players and schoolchildren, so players of any level can take part. 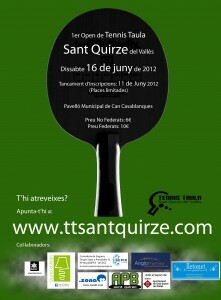 Players can register on the website of Sant Quirze del Vallès Table Tennis Club. Are you game?